The government-appointed Independent Examiner’s report mentioned previously has been accepted by the South Downs National Park Authority, and the next stage in its adoption is a referendum of the electors in the town. A revised version of the Plan taking account of the examiner’s findings has been produced and a reference copy is available in the Town Hall. It sets out detailed proposals for future land use in the town, in particular sites for new housing, and it will be taken into account when planning applications are considered. The Town Council was tasked by the South Downs National Park Authority to find sites for 220 dwellings in addition to those proposed for the North Street Quarter and Old Malling Farm. In fact the plan proposes 283 dwellings across a number of sites for development in the period through to 2033. One major advantage of having an adopted Neighbourhood Plan is that a higher proportion (25%) of the money paid by developers in the town under the Community Infrastructure Levy is returned to the Town Council for use on infrastructure projects. Without such a plan the amount returned is only 15%. 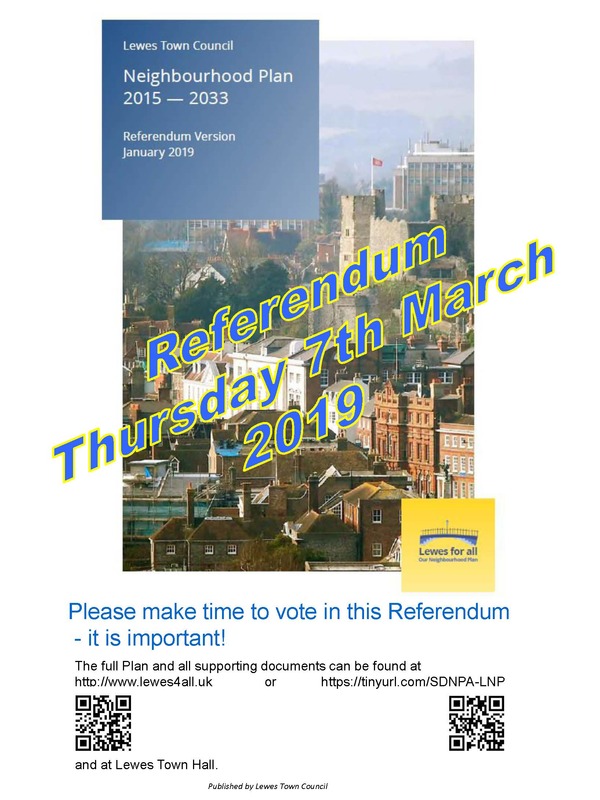 The Friends of Lewes is in favour of this Plan and asks that you vote YES for it at the referendum on Thursday 7 March 2019. A simple majority of those who vote will be sufficient for the Plan to be formally adopted by the South Downs National Park Authority. Further information on the plan, the referendum and voting are on the SDNPA website.